Gold! Always believe in your... ability to fly a drone. 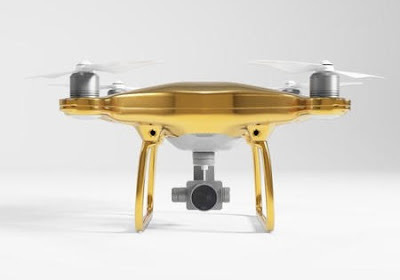 Gold-plated drone, anyone? Dronesdirect.co.uk thought the answer to that question would be a resounding YES and went ahead and released a special edition of the DJI Phantom 4. 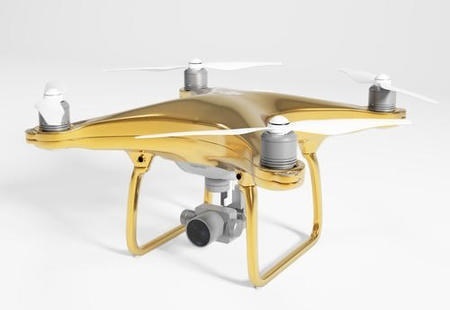 Covered with 24k gold, the drone apparently works just like a normal Phantom 4, but with more 'gangsta' appeal. Oh, and it only costs £20,000. Gulp. Actually, that's not true. The website lists the gold drone at £19,999.97, so that 3p reduction might sway you toward snapping one up. However, no matter how good you are at flying drones, turning tricks and loops and capturing awesome footage, we assume you'd feel a tad nervous with twenty grand hovering above your head. Maybe that's just us.